Freiderich, known as Fred, was born on September 16th, 1835 in St. Wendel, Germany. Fred's father was Johann Dahlem and his mother was Frederike Elizabeth Lindelman. His paternal grandparents were Jacob Dahlem and Veronica Ruth Dahlem. He was an only child. He died at the age of 89 on April 13th, 1925 in Jefferson, Oklahoma. He was buried on April 20th, 1925 in Liberty Cemetery, 4 miles east of Jefferson, Grant County, Oklahoma. Freiderich (Fred) Wilhelm Dahlem, oldest son of Johann and Frederike Elizabeth Lindelman Dahlem was born in St. Wendel Germany on September 16, 1835. He was the grandson of Jacob and Veronica Ruth Dahlem of Freishauser, Germany. Freiderich married in 1865. His wife Catharina Kunkle was born in Wolfersheim, Trolus Germany, November 10, 1844. Friedrich Dahlem inherited the family mill in Niederwürzbach. The mill had originally been the property of the Count of Leyen but passed to the Dahlems around the time of the French Revolution. Methods of milling were changing due to the industrial revolution and other social /economic changes. The mill failed. Friedrich and Catharina (the Grossmama) and children had to leave the mill, and they moved into a nearby village where they lived above an inn where Friedrich worked. The extended Dahlem family was not happy about the loss of the family patrimony. It was an embarrassing time for Grossmama and Grosspapa and children. The mill complex was really very palatial. They had been a wealthy family, but now they were poor and hungry. Soon after, their oldest son, Fred, began the emigration to America. They came to the United States and settled in Beatrice, Nebraska, before making the run into Oklahoma settling near Wakita, Oklahoma. Fred and Charles made the run with their father. Freiderich was a farmer between 1893 and 1925 in Wakita, Grant Co., Oklahoma. He died on 13 Apr 1925 in Jefferson, Grant Co., Oklahoma. "Old Grandpa (Fred) Dahlem and my Grandpa (John) Ciskowski became very close friends, they just lived a mile and a half apart, both had a German background. They both spoke German much more fluent than they did English. They loved to play cards together. I've heard this many times, they used to play a game called "66", it is kind of a rough game. I don't know who was the best player, but I think whoever could hit the table the hardest, when they played the card, probably thought he was the best. When the Dahlem kids would play cards, they would hit the table and go "Duh!" That was carry over from the Grandpas. It was quite a cut throat game. "Dorothy Breen was telling this little story not too long ago. My Grandpa Ciskowski was plowing along the road and Grandpa Dahlem, that is the old Grandpa Dahlem, came along and they stopped to visit. My Grandpa Ciskowski was plowing with two horses and a mule, with the mule in the center. Of course they stopped and grandpa turned around on the seat facing backwards. Grandpa Dahlem sat on the ground facing him. I guess after quite a long time, this mule in the center turned completely around. He must have been rather loosely hitched in there and he was facing the plow. Grandpa Dahlem said, 'John, is that the way you work them, that mule has to back up all the time?' Grandpa Ciskowski looked around and saw what was happening and said 'Fred, it's time for you to go home.'" He was remembered by Lorena Biby like this: "When Grandpa & Uncle Jake quit farming, they built their little house across the driveway from our house, in our yard. They must have moved there in 1917, because I know they were there when the First World War ended in 1918. Mamma had been at their house that night, and when she came home, she heard bells ringing and guns being fired in Jefferson, so the Armistice must have been signed, she said." 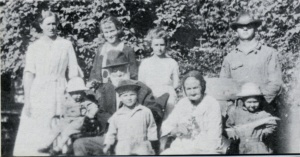 Children were: Catherine; Frederick Wilhelm; Henrich; Charles F.; William; Louise; Carolina Augusta, August; Jacob and John Frederick. All born in Niederwurzbach, Saarland Germany. His brother, Johann (John) preceeded him to America and settled in Clatonia, Gage County Nebraska in 1880. Friedrich and family stayed with brother John and family for a short time where they farmed. Freidrich farmed in Wakita and Jefferson, Grant County Oklahoma. After he retired from farming, in 1917, he built a house on the Henry Schuermann farm. He died at the age of 89, 13 April 1925, at the home of his daughter Carolina (Lena) Schuermann. Catherina Dahlem died 3 July 1923 in Jefferson, Oklahoma. Both ar buried in Liberty Cemetery, Jefferson, Oklahoma. The two were known as Grosspapa and Grossmama by their grandchildren. German for Grandpa and Grandma. Frederick William Dahlem had 1 daughter, Dorothy (Dahlem) Breen. Charles Frederick Dahlem had 8 children, Gladys, Carl, Rena, Louise, Lewis, Helen, Duane, and Paul. Henry Dahlem had two children, Henry and Catherine. Louise Dahlem Schlingmann had 2 girls, Wilhelamina and Anna Catherine. August Dahlem deceased in Germany. Jacob Dahlem did not marry. John Frederick Dahlem had two boys, Dale and Leland. Dale Donald Dehlem, born February 4, 1917, died October 19, 1977, married Evelyn Quigley. They had two children. Darla married Denny Misak and they had two children, Alan and Melia. Donna married Grant Buxton and they had one daughter, Evie Dawn. Leland Darrell Dahlem, born December 10, 1918, married Helen Hichols. They had 3 children, Darrell Wayne, born and died June 3, 1942. Janice married Larry Meritt and they had 2 children, Todd Allen Meritt, born April 28, 1964, and Michelle Renee Meritt born October 23, 1973. John Ray Dahlem was born October 20, 1949.
by: Janice Dahlem Meritt, History of Grant County Families, 1980, and others.